As the US Federal government takes up a petition calling for the removal of Puget Sound’s resident orcas from the Endangered Species list, a lack of funding at NOAA continues to hamper efforts to enforce regulations meant to protect them from harassment by whale watching boats. Seattle’s Q13 TV news team tells the sorry tale here, in both a text and 7-minute video version. Meanwhile, the area’s shipping din may increase yet again, as an EIS Scoping Period has begun as the Army Corps of Engineers begins planning for what could be the nation’s largest export facility, the Gateway Terminal, proposed for shipping coal to Asia. NOAA Fisheries announced on Monday that it would review the status of the southern resident population of killer whales, in response to a delisting petition from California farmers. In addition to boat noise, a decrease in salmon runs is a key driver of reduced orca populations, and protection plans for the orcas include protections for salmon, including maintaining river flows. The farmers claim this is denying them the water they need. The heart of the petition is a challenge to NOAA’s determination that this local population is genetically distinct and deserving protection, although the species as a whole is not threatened. “Oh great, here is a chance to biopsy them and tag them and chase them all over town until we don’t have to worry about them any more,” Felleman saidTo hi. m, the distinct behavior of the southern residents sets them clearly apart from other orcas. They eat only fish, while other orcas eat seals and other mammals. They have distinct family groups, dialects, greeting ceremonies and migratory patterns. The question of whether the southern resident killer whales are a genetically distinct population ran through the early years of the listing question, with NOAA initially determining they were not, a court ruling that the question should be studied more thoroughly, and a science task force finding they are distinct enough to warrant protection. One of two populations in the area (the other ranges over a wider area, and passes through seasonally), the southern resident population is under a hundred individuals. 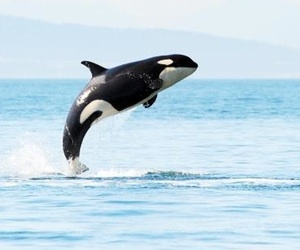 “The petition presents new information from scientific journal articles about killer whale genetics, addressing issues such as how closely related this small population is to other populations, and meets the agency’s standard for accepting a petition to review,” says a NOAA release. The petition exasperates Howard Garrett of Orca Network, a Washington state-based non-profit advocacy group for Pacific Northwest whales, but he believes the National Oceanic and Atmospheric Administration is simply doing due diligence. An Australian Senate Committee has recommended against passage of a proposed bill that would define excessive noise for wind farms as 10dBA above ambient, and suspend operations of wind farms failing to meet that standard. In extensive submitted statements and published testimony, the Committee heard from a wide range of witnesses from Australia, the UK, the US, and Canada, including many names familiar to those following the wind farm noise issue. The final report is also rather extensive; among the key reasons for recommending against passage was the perception that in Australia’s key wind farm areas, current regulations should be sufficient; in rural areas of New South Wales, South Australia, and Western Australia, noise limits are already 35dBA in quiet conditions. Yet noise complaints continue to be widespread, though wind proponents and opponents disagree on how many are bothered; the Committee noted that distrust has led many people with problems to not lodge formal complaints with wind companies or regulatory authorities. The bad blood goes both ways: wind company representatives reported that their attempts to meet with a physician reporting problems have been repeatedly rebuffed, while acousticians studying responses in some problem areas have found it impossible to obtain turbine operations data that would allow them to investigate correlations between operations and their measurements. A provision in the bill to require noise, weather, wind, and power data from wind farms to be made available online was met with strong resistance from wind companies, who felt it was an onerous requirement, and suggested that power data on specific turbines and wind could be “reverse engineered” by competitors and undermine their future project planning; the Committee recommended that such data be made available to regulatory authorities, rather than publicly (though in recommending the bill be not passed, it’s uncertain how or whether the full Senate might take up this point). Another factor mentioned in the final report is that proponents of the bill presented testimony that suggested to the committee that there was disagreement about whether the proposed 10dBA over ambient limit was the best choice; indeed, some suggested that 5dBA over ambient would be more sensible, and others suggested lower dB limits, especially at night. While the focus of the bill itself was audible noise, some of the testimony addressed health effects and infrasound questions; on this point, the committee seemed to be especially interested in a presumed “nocebo” effect, by which an expectation of harm can lead to some proportion of people experiencing harmful effects. While widespread reports of health effects was a driving factor among Committee members pushing for this bill, the final report suggests that some of the letters submitted, describing a wide range of symptoms, did not suggest any simple cause and effect. The Committee seemed especially concerned by dozens of letters from areas where wind farms are not yet operating expressing fears about health effects should wind farms be built near them. The final report quotes a study on nocebo and infrasound which will be published next year. Nocebo has been suggested as an explanation for clusters of health complaints around some wind farms; while the concept has been around for many years in relation to other sources of community concerns, it’s unclear how deeply it has been investigated. Several witnesses pointed out that any such effect, even if it may apply to some individuals, should not be considered a primary factor when there are viable pathways by which audible sound can cause the observed responses, in particular in relation to sleep disruption by audible noise. At the end of the Committee’s report, five Senators point out that the ongoing literature review being undertaken by the National Health and Medical Research Council does not fulfill the call by an 2011 Senate report, The Social and Economic Impact of Rural Wind Farms, for the Australian government to fund new epidemiological studies on wind farms and human health. The Committee’s records contain a wealth of documentation and perspectives well worth perusing. The first link above takes you to the Committee’s page on the bill, where you can access a list (with PDF links) of all documents submitted to the committee by witnesses and the general public, as well as a transcript of the Committee’s hearings and testimony made there. Researchers from Woods Hole Oceanographic Institute have begun a 2-3 year project that will monitor the soundscape at the Cape Wind site before, during, and after construction of the planned 130 wind turbines. This is the first time such a long-term acoustic monitoring study has taken place at an offshore wind site. Two kinds of acoustic recorders are being used: one records the full range of frequencies continuously for a week at a time; the other samples one minute of sound every ten minutes for 2-3 months, at frequencies up to 40kHz (thus missing echolocation clicks but capturing most other vocalizations of interest). “So we’re making the best of both worlds, putting one device out to get a really in-depth look for one week, and then we continue with the other device to get a sampling period of several months, then we replace both,” Mooney said. During wind farm construction, pile driving will add significantly to existing human noise in the area; at European wind farm sites, some species tend to move as far as 20km away during construction. 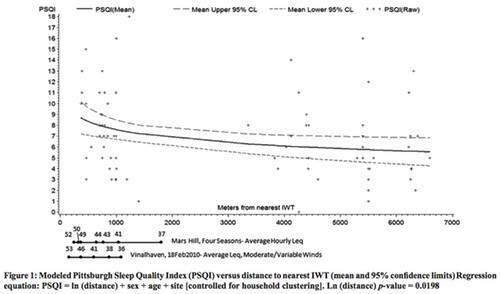 During operation of the wind farm, noise is not expected to be audible at distances more than a few tens or hundreds of yards, but this study will help to quantify exactly what frequencies are propagating into the waters. Mooney would like to see the project also contribute to a growing research focus on using sounds to monitor overall environmental health of various habitats. “Animals make sounds when they attract mates or reproduce, and you can track those activities just by listening,” Mooney said. “What I’d love to do with this project is to look at biological diversity. In a nice healthy habitat, you have a spectrum of sounds: low-frequency sounds of fish, then invertebrates a little bit higher, and then the seals and the dolphins.” The soundscape of an undersea area under an environmental stress would sound different; the impacts could be assessed by listening to what’s missing, for example. For more on the project, see this page on the WHOI website, which also includes recordings of more than a dozen species of ocean creatures. At long last, I’ve completed this year’s overview of science and policy developments on wind farm noise issues. It features over 50 pages of new material, along with about the same in Appendices consisting of three research summaries I wrote earlier in the year. You can download a pdf version of Wind Farm Noise 2012 here. AEI’s three Wind Farm Noise annual reports go into depth on different topics, and they complement each other quite well, though each one clearly engages the issues with more detail and reflects a more nuanced appreciation of the topic than the ones that came before. You can access all three, and AEI’s other publications on the issue, on our Wind Farm Noise Resources page. 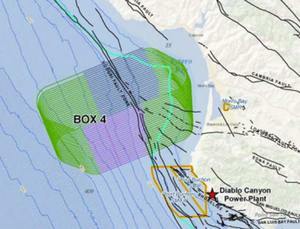 The California Coastal Commission has rejected plans by Pacific Gas and Electric to conduct a seismic survey later this month to gain better understanding of earthquake faults near the Diablo Canyon nuclear power plant. The CCC vote affirmed staff recommendations that the information gained did not justify the likely effects on ocean life. The survey would have included about nine days worth of airgun activity; the airguns fire bursts of pressurized air up to four times per minute. The sound created by the burst of air is loud enough to penetrate deep into the ocean floor, with echoes revealing geological information. The project’s environmental assessment documents project that the sound could be audible for up to 60 miles alongshore, and 150 miles offshore; sound loud enough to trigger behavioral changes extends for 2-3 miles, and sound loud enough to cause injury extends to about a half mile. The survey tracks (purple and blue above) come within a mile or so of one corner of a Marine Protected Area (orange outline above). While most local species would be minimally affected (less than one percent of regional stock hearing sounds loud enough to trigger behavioral reactions), the potential impact on harbor porpoises were a sticking point for the CCC—75% of the local stock was expected to experience some level of behavioral change. (Ed. note: Harbor porpoises are known to be more sensitive to noise than many species; some environmental assessments extend the behavioral impact zone for them out to the audibility distance; I’m not sure if that was done here, but it would seem plausible, given the much higher proportion of the regional population expected to be affected.) Though PG&E said that any negative effects were likely to be minor and temporary (and NMFS agreed, in issuing draft federal Incidental Harassment Authorization in September). The CCC disagreed, in part because PG&E has already established that the Diablo Canyon plant can survive nearby earthquakes; some CCC members spoke in favor of simply closing the plant when it’s up for license renewal, which would negate the need for further earthquake study. For more detailed coverage, see articles from the Santa Cruz Sentinel/San Jose Mercury News and The (San Luis Obispo) Tribune. The most recent project description from PG&E is here; and the NMFS draft IHA includes tables detailing the projected numbers of animals to be affected. Insects have joined birds, frogs, and whales in the list of species that change their calls so that they can be heard above chronic human noise. Researchers at the University of Bielefeld in Germany compared the songs of grasshoppers that lived near a road with those living in open grassland; “We found that grasshoppers from noisy habitats boost the volume of the lower-frequency part of their song, which makes sense since road noise can mask signals in this part of the frequency spectrum,” said Ulrike Lampe, the lead researcher. “Increased noise levels could affect grasshopper courtship in several ways. It could prevent females from hearing male courtship songs properly, prevent females from recognising males of their own species, or impair females’ ability to estimate how attractive a male is from his song,” she said. The crux of the matter: is rural peace and quiet a “right”? 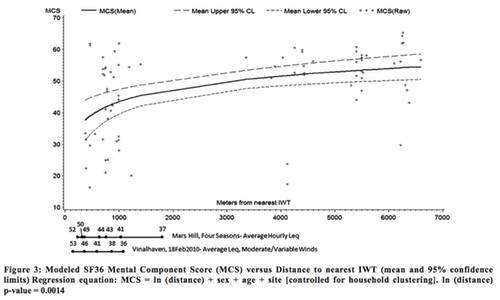 The argument is often made that turbine noise is far less intrusive than what city dwellers live with all the time, or that wind farms are not as loud as tractors, trucks, snowmobiles, or other mainstays of rural life. These both skirt the central question, which is whether people, or communities, in rural areas can be justified in their complaints about noise, or in adopting ordinances that require significantly lower noise levels than the industry is used to (or perhaps even lower noise limits for turbines than what is accepted in noise from the everyday activities of rural life). Many of the towns and counties that have recently established larger setbacks or lower sound limits are attempting to protect their residents’ rights to the rural quality of life and sense of place that they live there to enjoy. The most extreme of these have setbacks large enough (2 miles) or noise limits quiet enough (as low as 25dB at night) to effectively offer absolute protection to existing peace and quiet; in so doing, they may also be effectively banning industrial wind development (though allowing for easements to build closer to willing neighbors may offer a way forward in towns where there aren’t large enough areas of open space to accommodate such standards). Kially Ruiz, co-owner of the Independence turbine, which began operating in May, said that he would not change the turbine’s operations unless there is proof it’s out of compliance with state noise limits; O’Donnell concurred, saying “Everyone in the room Monday knows all my turbines are well within the limits for noise.” As a result of previous complaints, the Massachusetts Clean Energy Center is scheduled to hire a consultant to do sound measurements this winter, with results by spring. This may well turn out to be another project in which turbines operating within legal sound limits still cause noise problems. Such experiences have spurred some community groups and acousticians to recommend lower noise limits in areas close to many homes. The formal noise complaints have begun at Lowell Mountain, Vermont, even before the project is fully online. Thirty-two neighbors filed a complaint with the state Public Service Department after two days of troublesome noise this week from ten of the eventual 21 turbines. Low clouds may have contributed to the noise levels, which woke several people in the early morning hours of November 3, and continued through that day and the next. UPDATE, 12/3/12: Green Mountain Power reports that the excessive noise on the weekend of November 3-4 was caused by a build up of wet snow on the blades. GMP spokesman Robert Dostis says that if neighbors had called them about the noise, the turbines would have been shut down immediately. About half of the people who signed the letter live within a mile and a quarter of the turbines (6 within a mile, 9 more within a mile and a quarter), with most of the rest between two and three and a half miles away (7 heard it from over 3 miles). Many noted that the noise was clearly audible inside their homes. The Lowell Mountain project has been contentious from the start, with mountain preservation activists blocking construction at times. During construction, blast debris from the site crossed property lines of some neighbors, leading to a legal back-and-forth in which land owners were temporarily prevented from being on those parts of their property (where some individuals set up tents in an effort to block the blasting). Kingdom Community Wind, the developer, was pleased that no one lived within a half mile, and few within a mile (see map above; blue ring is half-mile), and confidently quoted a DOE estimate that at just over 1000 feet, the turbines would be no louder than “a quiet bedroom.” And though the project is popular among many in the region, it appears that we are about to be hearing from another community where turbine noise causes more widespread push-back from those living nearby than the reassuring assumptions would suggest. UPDATE, 11/15/12: A local radio station adds this response from Green Mountain Power’s Dottie Schnure, who said the noises were an anomaly. “There are some very specific conditions if they happen at once– based on wind speed, weather conditions, moisture in the atmosphere– that can create noise. So, when that happens we are able to modify our operations so we do not create a noise issue.” Schnure says residents are encouraged to call up and report excessive noise, something that wasn’t done immediately in this case. UPDATE, 11/9/12: See this good piece on a Vermont independent media website; the reporter visited with project owners and opponents the day after the above letter was circulated by the Nelsons. A man working in his sugar bush between one and two miles from the turbines, called it “the goddamnest roar you ever heard in your life.” He and his son were unable to hear each other, even yelling, when about a hundred feet apart in the woods. Geoffrey Commons of the state Public Service Department said this week, “We will gladly take complaints, and we are keeping a record. Noise monitoring will be done according to a plan … that will not start until all the turbines are in operation” Mr. Commons said.